In this blog, we’ll look at essential tips you should be aware of when you transform instructor-led training to e-learning. Synchronous e-learning – synchronous e-learning brings together the best elements of instructor-led learning and e-learning, without the need for any participant to travel. In synchronous e-learning, learners complete an e-learning course while connected to a virtual classroom that has an instructor, facilitator, mentor, or tutor who can offer help or training in real-time. The opposite of this is asynchronous e-learning where learners complete courses at a time that suits them with no real-time involvement from an instructor. Blended learning – this is a technique that involves both e-learning and classroom-based elements. So, for example, learners can complete some modules through e-learning and then attend a classroom in person for instructor-led elements/modules of the course. Another crucial part of transforming instructor-led training to e-learning is to get a full understanding of the learners who will complete the training. Of course, understanding who your learners are is important for instructor-led training too, but the options available when you use e-learning make it even more important. Specifically, you can more easily tailor content to groups of learners with e-learning than you can with instructor-led training. You will get the most from these customisation opportunities when you fully understand your learners, i.e. what are their current skill levels, what is their motivation for completing the course, how relevant is the course content to them, will they understand that relevance, etc. You will get nowhere near the full range of benefits offered by e-learning if all you do is convert learning materials used in instructor-led training. Instead, follow the next three tips. You can get much more creative with an e-learning course than you can with an instructor-led course. This includes adding multimedia elements to your courses such as audio, video, and images. You can also add other elements that will make the course more enjoyable, interactive, and effective. This includes gamification elements as well as interactive quizzes, social features, rewards features, and more. Just be cautious when doing the above, however, ensuring you only add creative elements when they enhance the learner experience. Therefore, avoid anything that gets in the way or distracts the learner. E-learning technology makes all the ideas in the above point possible. In addition, you can use the technology e-learning offers to let your team complete e-learning courses on their own devices, i.e. their phone. By doing so, you will increase engagement rates, completion rates, knowledge retention rates, and more. You might already be worried after reading the above that you don’t have the necessary skills and knowledge in-house to achieve all these tips. You shouldn’t be worried, however, as you are not alone. Plus, there are solutions. In fact, you should treat developing an e-learning course the same way you treat getting a website built, a video produced, or a brochure created, i.e. you should bring in the e-learning professionals in Dubai. When you get help from e-learning experts by outsourcing the development of your courses, you will get better results and a higher return on investment. 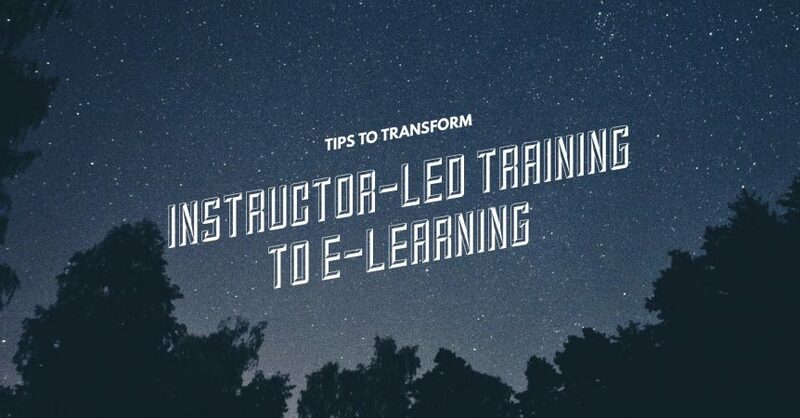 The best time to start transforming instructor-led training to e-learning is now. Take the process step-by-step, understand the objectives of each part of your training plan, get the right e-learning expertise, and focus on the above tips. When you do this, the result will be a successful e-learning strategy.